When Ivonne and Lisa, the venerable founders of The Daring Bakers, choose a challenge, you know it’s going to be a challenge. Think Buche de Noel (Yule Log Cake), or in this case, think…L’Opera! Yes, Opera cake. Until now I’ve never tasted or made one, though I’ve seen them in posh bakeries, but I do have a very strong memory regarding opera cake that comes from a certain episode of Your Reality Checked, a show on Fine Living in which participants take time off from their regular jobs/lives to try something new. In this particular episode, a trained chef wants to try out being a pastry chef and she ends up doing a short stint at Porto’s Bakery. She’s given a big challenge…make an opera cake. Her first experience ends in failure and the cake is rejected. She tries and tries, and with a lot of practice and effort finally gets it right (almost). I felt her pain as she struggled with the cake not knowing that a couple years down the road I would REALLY feel her pain! So at the beginning of May when the challenge was announced and I saw it was L’Opera, I had a flashback to that woman and her very public struggle and I started sweating. Michael asked about the challenge. “I’m going to try.” Hopefully I sounded more confident than I felt. As with all our challenges, we have strict rules to follow and allowances for creativity. In this challenge, we had to make the almond cake (joconde), a buttercream, and a glaze. An additional white chocolate mousse was optional, and we could choose the shapes and flavors as long as they were light in color. No dark chocolates or coffee flavors, no brown, black, or grey colors. The cake had to be light in color. The choice to go light is in honor of Barbara of Winos and Foodies, a former Daring Baker and founder of the Taste of Yellow event, a woman who has struggled with cancer and displays a beautiful spirit. Barbara, our May challenge is dedicated to you! Fortunately the challenge could be spread out over several days or longer since some of the components could be made ahead. I started planning obsessively. Because the decoration is the flourish and so must look perfect, I practiced making G clefs with cheap grocery store frosting. I can draw a good G clef (hey, I did learn a thing or two while working on my music degree), but making one with frosting was another matter. Some of my G clefs turned out well, others, not so much. Oh well, at least I still have a decent singing voice if not good piping skills! Oh my, this promised to be rich and decadent! And spendy! The almond meal costs $11.99 per one pound bag in our area, so I decided to purchase blanched slivered almonds in bulk and grind my own, which saved me about $5.00 and gave me some leftover slivered almonds for other uses. My home ground almond meal was not as fine as the commercially ground almond meal, so my cakes have a bit of texture as a result, but that’s OK.
I’m happy to say none of the individual parts of the cake presented any problems, thank goodness, and the biggest challenge for me was assembly and decorating. In fact I helped Bob the Builder and Top Gun make their own mini cakes first (which I forgot to photograph before they ate), and I used that as an opportunity to practice. If I were to do this again, I would use dessert rings lined with wax paper or parchment to keep everything together while assembling and to keep the glaze from running off. Then after a little refrigeration time, unmold and serve. I did catch myself holding my breath as I poured the white chocolate glaze over the mini cakes, and Michael asked me to please not pass out in the cake! Overall, I think the cakes turned out well, though not traditional and certainly not perfect and professional looking (especially served on Dixie plates! ), but not bad for a first timer. I enjoyed the combination of the lemon and lavender, and my boys were very proud of their little cakes. The recipe below represents what I did in order, including customizing the flavors. You can find the full original recipe at Cream Puffs in Venice, and of course you can check out the beautiful opera cakes from all The Daring Bakers! Many thanks to Ivonne and Lisa and their co-hosts Fran of the blog Apples Peaches Pumpkin Pie and Shea of the blog Whiskful for such an interesting and educational challenge! Adapted from Paris Sweets by Dorie Greenspan and Chocolate Passion by Tish Boyle and Timothy Moriarty. NOTE: You can make the syrup up to one week in advance and store covered in the refrigerator. The leftovers are delicious in tea. 1. In the small saucepan, stir together all the syrup ingredients and bring to a boil. 2. Remove from the heat and let cool to room temperature. Strain to remove the lavender and zest and keep the liquid. Note: You can make buttercream up to four days in advance and store covered in the refrigerator. If you want to make it far ahead, you can make it up to one month in advance and freeze it in an airtight container. To use the chilled or frozen buttercream, simply bring it to room temperature and then beat it briefly to restore its consistency. 1. In the small sauce pan, combine the sugar, water and vanilla bean seeds or extract and warm over medium heat just until the sugar dissolves. 2. Continue to cook, without stirring, until the syrup reaches 225° F (107° C) on a candy or instant-read thermometer. Once it reaches that temperature, remove the syrup from the heat. 5. Raise the speed to medium-high and continue beating until the eggs are thick and satiny and the mixture is cool to the touch, about 5 minutes or so. 8. Add the lemon extract and zest and beat for an additional minute or so. 9. Refrigerate the buttercream, stirring it often, until it’s set enough to spread when topped with a layer of cake, about 20 minutes. NOTE: Can be made up to one day ahead and stored in the refrigerator. 1. Melt the white chocolate and the 3 tablespoons of heavy cream in a small saucepan or in a glass bowl in the microwave. If using the microwave, start with 30 seconds on 70%. Stir and microwave for another 15 seconds or so, but do not allow the chocolate to melt completely in the microwave or it might seize. Remove and stir in the last few chunks of chocolate. 6. If you’re not going to use it right away, refrigerate until you’re ready to use. NOTE: You can make the cake up to one day in advance and store at room temperature. 2. Preheat the oven to 425°F. (220°C). 3. Line the two jelly-roll pans with parchment paper and brush with melted butter. 5. If you only have one bowl, wash it after removing the egg whites or if you have a second bowl, use that one. Attach the paddle attachment to the stand mixer (or using a handheld mixer again) and beat the almonds, confectioners sugar and eggs on medium speed until light and voluminous, about 3 minutes. 6. Add the flour and beat on low speed until the flour is just combined, no more than about 15 seconds. Be very careful not to overmix, or the cake will lose volume. 7. Using a rubber spatula, gently fold the meringue into the almond mixture and then fold in the melted butter. Start with just 1/3 of the meringue and make sure it’s folded in, then add another 1/3 and another, folding gently each time. Divide the batter between the pans and spread it evenly to cover the entire surface of each pan. 8. Bake the cake layers until they are lightly browned and just springy to the touch. This could take anywhere from 5 to 9 minutes depending on your oven. Place one jelly-roll pan in the middle of the oven and the second jelly-roll pan in the bottom third of the oven. Rotate pans as necessary for even color. 9. Put the pans on a heatproof counter and run a sharp knife along the edges of the cake to loosen it from the pan. Cover each with a sheet of parchment or wax paper, position wire racks over the parchment, and turn the pans over. Remove the pans. 10. Carefully peel away the parchment, then turn the parchment over and use it to cover the cakes. Let the cakes cool to room temperature. If you are leaving overnight, you may want to lay a tea towel over the parchment to help conserve moisture. NOTE: Make right before you are ready to finish and serve the cake. 1. 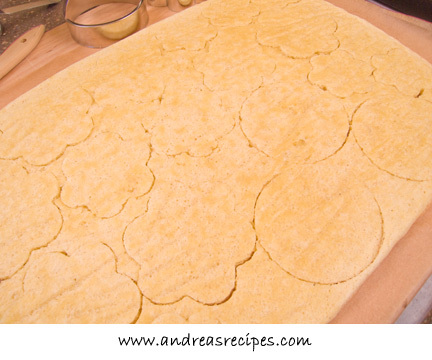 Place a sheet of wax paper on a sheet pan or jellyroll pan. 2. Using the cookie cutters, cut shapes in the two cakes in multiples of three. 3. Place the bottom of each mini cake on the wax paper. Brush generously with syrup. 4. Take the second layer of cake and smear buttercream on one side, and place buttercream side down on the base layer. 5. Brush the top of the second cake layer with syrup. 7. Brush the top layer with syrup. Chill in refrigerator for about 30 minutes, until very firm. 9. Prepare the glaze while the cake chills and allow to come to room temperature. Pour or spread it on top of the finished cakes, then chill cakes until the glaze is set. Fit the sandwich bag with the #3 decorating tip and couplers, and add either buttercream or mousse. 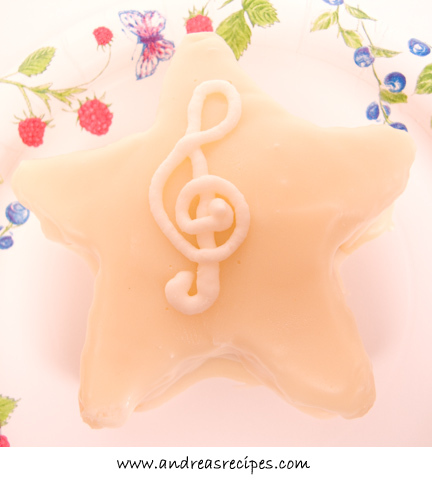 Decorate the cakes with the G clef design and serve chilled. 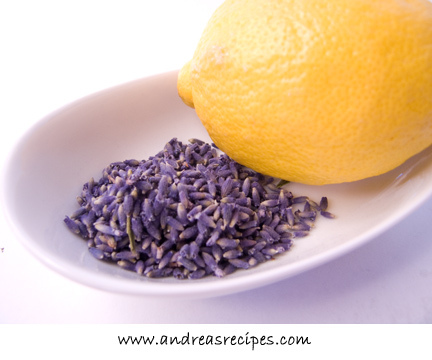 Mmm, lemon and lavender, what a great idea for a flavour combo for spring. I like the idea of using small shapes for the cake. Beautiful pics, and I think your clefs are just fine. Those little shapes are so sweet. Great job Andrea! Your cakes look so very pretty! And I love the lemon and lavender flavorings! Great job on the challenge. Your cakes look incredible! Lavender and Lemon, I want one of your little cakes Andrea! I love that you decided to do mini-cakes. I think that would have eliminated a lot of the problems I had. Your individual cakes are very cute, and the flavor combination sounds just lovely! Lavender and Lemon sounds lovely! 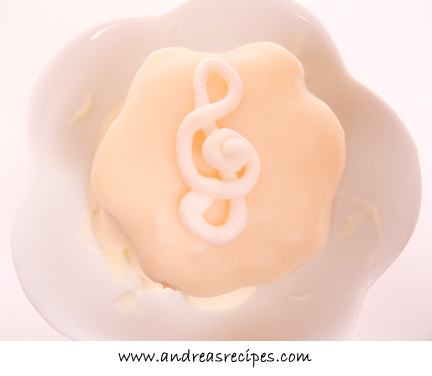 I remember practicing the treble clef back in grade school and it was enough for me not to attempt it with frosting! Yours looks great! You plotted it out well. Beautiful designs and fresh spring flavors. A masterpiece! I just LOVE the shapes Andrea! What a super cute idea and I love the combination of lemon and lavender – one of my alltime favorites! Lovely cakes! I like that you made cut-outs, and lemon and lavender are a wonderful combination. Thanks for visiting my site! I love your mini cakes! Your cakes look incredible! I was tempted to do some mini cakes but I gave up thinking I would be causing chaos in my little kitchen. And I love the sound of the lavender and lemon combo too….. Great job!!! I love that the cakes have different shapes. They all look gorgeous. All your shapes are just beautiful! Your cakes look elegant and delicious! I just think they are so cute! And aren’t you glad you weren’t being televised while making them! Splendid Opera, very nice. Well thankfully YOUR reality checked turned out better than the professional chef’s experience. I think your mini cakes look splendid and I love the lemon and lavender combination. Great job! great flavor combination–love the shapes, too! Really like the shapes you chose. When I decided to do the marbling, I thought of strewn lavender…but then I forgot. Adorable little cakes! I was very surprised to learn the price of almond flour, good for you for making your own! Very cute and dainty! Your cakes look perfect! This is just darling – it looks like a little petite four. Very cute. Andrea, your cake looks just great! Fantastic job on the challenge and I do agree it was a bit pricey – but well worth it! And I’m with you on the ring mold idea, my rounds did not come out as straight as I’d have liked either. Well these are too darn cute! I can’t believe you were in a panic. And, I love the lavender-lemon combo. I wish I had thought of that! You did a wonderful job on your cake. It looks simply beautiful. Your cakes turned out wonderfully! I love the darling little shapes. Lemon and lavendar sounds like a perfect flavor pairing. Good job! I love the different shapes of your cakes! 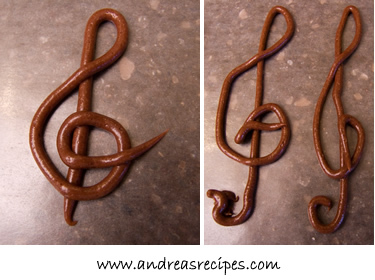 And I can’t even write a clef on paper, much less in icing! Great job! Lemon and lavender – lovely. Andrea the cake looks delicious! Lavender and lemon, what a great combination! Your cake looks fab. Lemon and lavender sounds pretty interesting, but in reading I couldn’t find what you thought about it. I love lavender and chocolate. Lovely cakes, and great photography. Love the shape. The picture of the lemon and lavender is beautiful! Great job! My favorite combination! And such sweet little cakes. Beautiful work! HA! I didn’t even know it was a Dixie plate. The cake looks like a perfect little petite fours! Glad you succeeded. How elegant! The flavors you chose sound so delicate, and I love the different shapes. I’d say that pastry chef would be way jealous of your first attempt at Opera! They are gorgeous and I love the flavors you chose, sweets! Great idea for a flavor choices! And the small shapes are adorable! What a pretty cake – you did a stunning job. Thanks everyone! And for the record Fine Living has NOT called yet, and neither has Porto’s. I think I’m out of my league!!! I can honestly attest to the wonderful flavoring the lavender and lemon provided….however, I must say that I was scraping the white chocolate frosting off the styrofoam plate with my fingernails…..ah it’s so great to be one of Andrea’s Daring Baker taste testers!!! Bravo! I totally approve of the lavender choice!! Your cake turned out gorgeous! Well done!